As content marketing continues to expand and evolve, increasingly it’s used by B2C marketers to achieve core business objectives. According to 2013 B2C Content Marketing Research by Content Marketing Institute and MarketingProfs, B2C marketers use content marketing to retain customers and build loyalty, acquire new customers, and increase brand awareness. Although the underlying intent of these goals is to increase sales, shorter term they all involve engagement, a strong point of social media. While most of their content marketing related objectives are associated with the purchase process, only half of B2C marketers use content marketing to drive sales directly. In part, this is attributed to the fact that marketers don’t use contextually relevant calls-to-action which may be attributed to concern over being too promotional or lack of awareness. 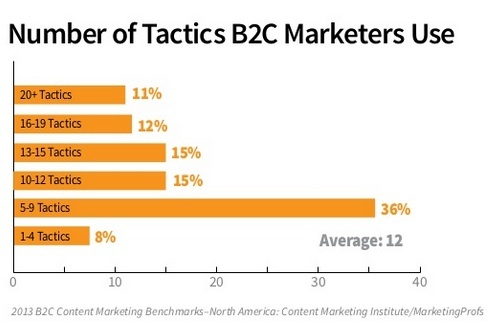 B2C marketers use an average of twelve content marketing tactics. Deeper examination of the data shows that companies with over 10,000 employees used sixteen tactics while smaller companies used an average of ten tactics. This makes sense since the larger the number of content marketing tactics used, the more headcount is required to handle the additional work and increased complexity. 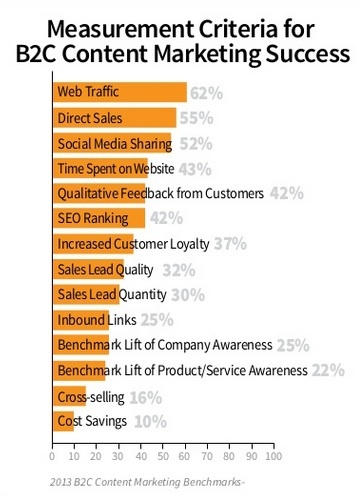 Social media dominates B2C content marketing. 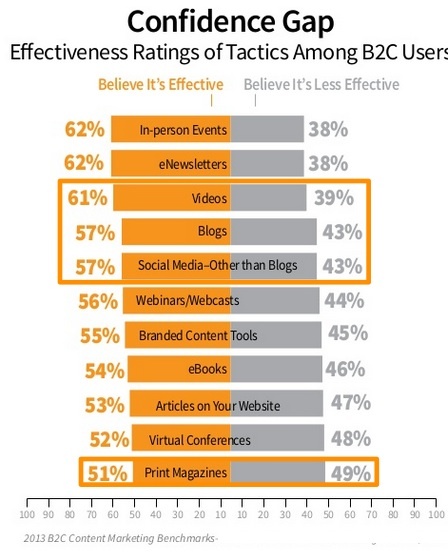 Of the top five content marketing tactics B2C marketers use, three are forms of social media. Interestingly, mobile in the form of mobile content and mobile apps as print magazines are used by more than two out of five B2C marketers. This underscores the fact that consumers use a variety of media formats to gather purchase related information. B2C marketers have confidence in social media platforms as a distribution channel for their content marketing. This makes sense because most social media platforms are targeted at consumers, some of whom use these sites to source product information and ideas. (This is particularly true for Pinterest.) Interestingly, B2C marketers trust old fashioned print magazines as an effective content marketing tactic due to its ability to deliver great photography and related text. B2C marketers distribute their content marketing via an average of four social media platforms. As consumer focused sites, it’s no surprise that 90% of B2C marketers use Facebook and roughly 70% use Twitter to expand their reach. About half of B2C marketers use LinkedIn, business’ home on social media. Of course, LinkedIn is useful for establishing business credibility and supporting human resources cost effectively. 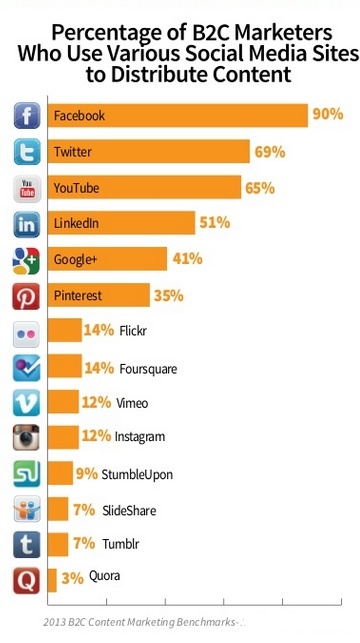 Of note is that Google+ outranks Pinterest, 2012’s social media darling. Further, Instagram which shows your offering in the best light possible and Tumblr a social media magnet for the under 25 set are used by less than one in seven marketers. (Here’s 47 Social Media Research Charts..) BTW—here’s an analysis of B2B content marketing distributed on social media. Despite B2C content marketing goals centered on customers, both retention and acquisition, the top content marketing metric is pageviews which doesn’t necessarily translate to sales or new customers. Interestingly, over half of marketers use direct sales as a core content marketing metric; this is slightly more than the number of marketers for whom sales are a goal. Marketers need to understand how to drive prospects from their content marketing offering to their product offering and retail establishments to better connect their marketing to their sales process. Despite the focus on increasing brand awareness, no one’s measuring any impact. This may be attributable to the fact that branding often requires additional investment to be tracked effectively. 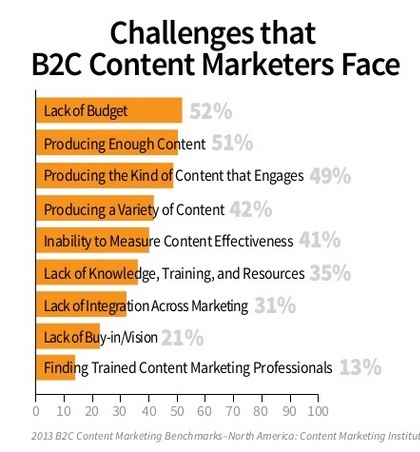 When it comes to putting their money where their content marketing is, while the majority of B2C marketers plan to increase their investment, roughly a third will keep their investment flat. 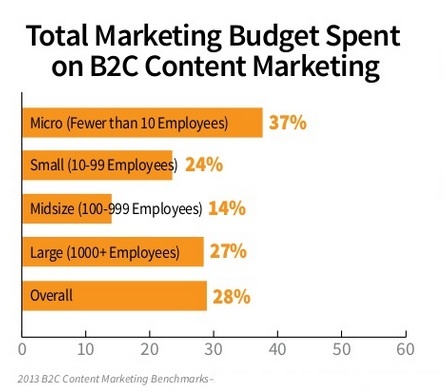 On average B2C marketers spend slightly more than a quarter of their budget on content marketing. Given B2C marketers’ need for high priced mass advertising such as television ads to build their brands and extend their reach, the fact that they dedicate this amount of their budget to content is impressive. More than half of B2C marketers create their content in-house without external resources. 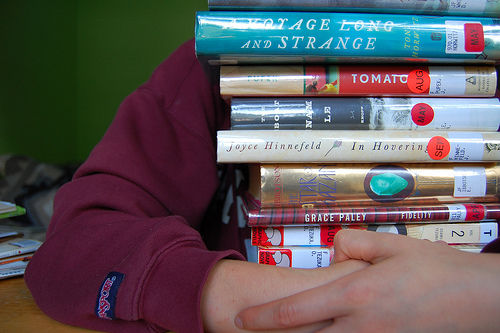 The larger the organization, the more likely it is to outsource its content marketing. 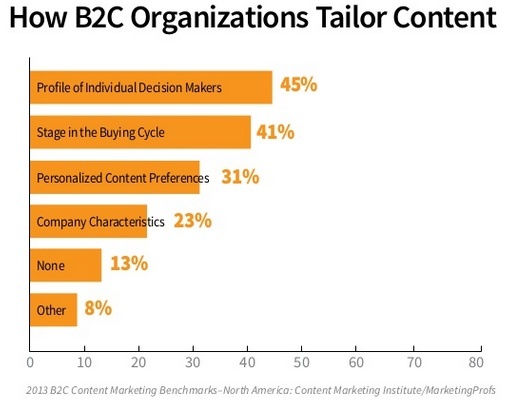 85% of B2C content marketers tailor their content in some way. They’re most likely to tailor it to the individual decision maker or the stage in the buying cycle. 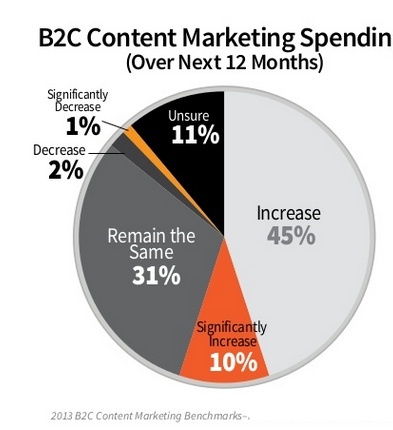 Over 50% of B2C marketers have trouble getting a budget for their content marketing. In part this may be attributed to following the proven use of mass media advertising to increase brand awareness and drive sales as well as the lower relative cost of content marketing. The budget challenge is followed closely by the challenge of creating sufficient content to meet prospect and customer needs. 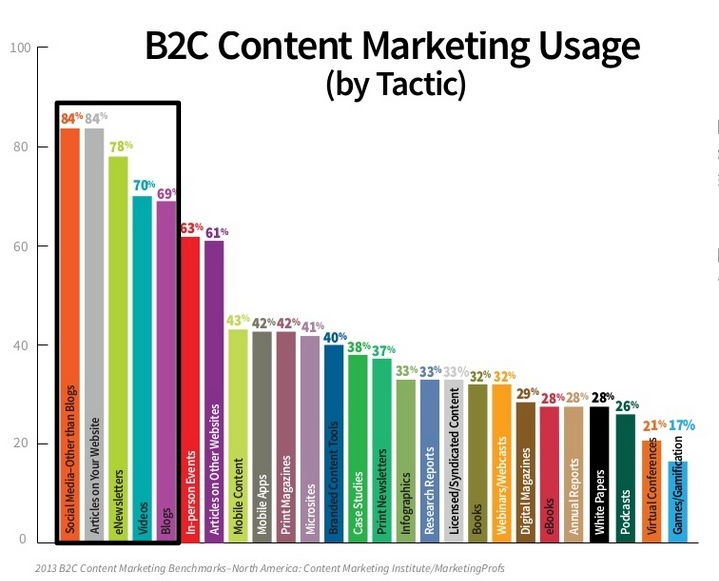 While B2C content marketing is less mature than B2B content marketing, it will continue to mature and evolve through 2013 and beyond, in large part driven by the need to fuel social media marketing and engagement. 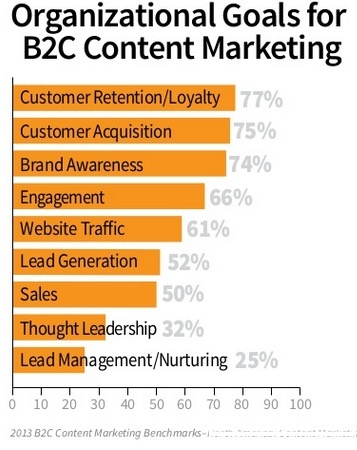 What other B2C content marketing trends do you see as important and why? Here are some related content marketing articles you may find of interest. Tags B2C, Chart, Content Marketing Institute, MarketingProfs, Research, Social Media. Bookmark the permalink. Very Nice Post. Served my purpose.